In March 1971 2 RCHA conducted firing trials on the Odin Computer System which includes a general purpose computer, a laser range finder and a muzzle velocity analyser. Members of the Regiment were very impressed with all three pieces of equipment and in general consider the Odin System to be superior to contemporary British and US designs. The following paragraphs are a layman’s attempt to describe the system in language that a GPO might understand. The Odin System was designed by Norwegian engineers in close consultation with Norwegian gunners to automate the manual computation system now in use by the Royal Norwegian Artillery. The Norwegian system, incidently, is very similar to the Canadian. 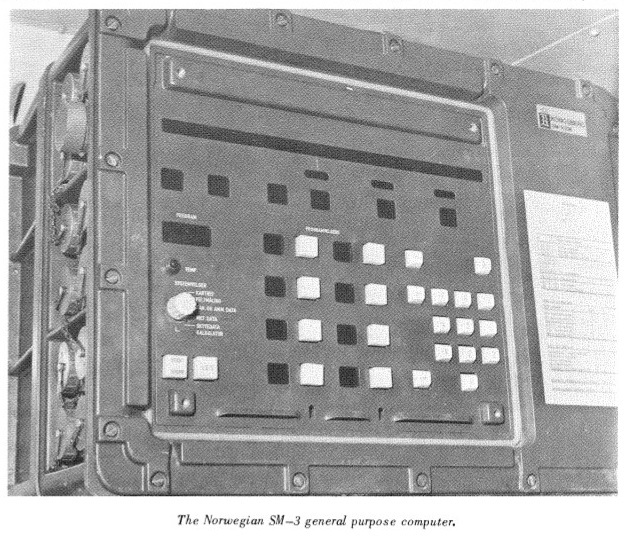 The Odin is based on the Norwegian SM-3 general purpose computer, an integrated circuit type. 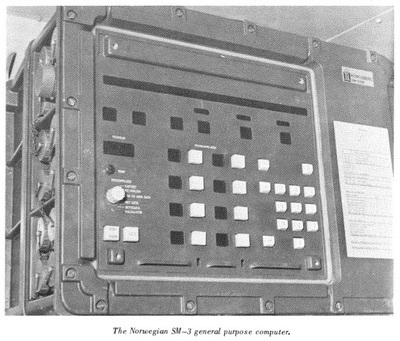 The SM-3 has a basic memory of 16,384 words each of 16 bits with a capability of expansion to 65,536 words. The SM-3 is a small machine slightly over two feet in width, 18 ½ inches high and 15 ½ inches deep. The weight is approximately 200 lbs including power cable, and the general layout can be seen in Fig. 1 below. In Fig. 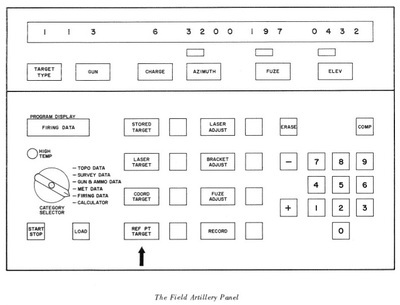 1 the computer is shown equipped with the Field Artillery Panel which includes the Artillery program. In this configuration there is no add-on hardware required with the exception of a vehicle mounting kit. The Odin operates on 24 volts DC with a power consumption of 350 watts per hour and can, therefore, be operated from an unmodified standard vehicle. 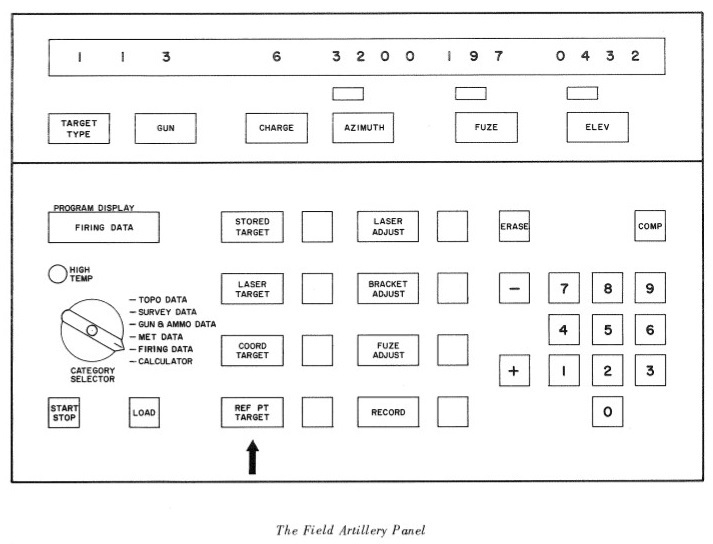 The system operates through a temperature range of -40 to 55 degrees C. The Field Artillery Panel was designed with the operator in mind and ease of operation a paramount consideration. Because over 60 different inputs are required in the computation of firing data, Norwegian engineers decided not to employ a matrix of the FADAC type because of the slowness of entry and liability of operator error. Instead, in the Odin system, all problems are grouped according to category and each category requires only up to eight inputs by the operator which are displayed for a visual check and may be corrected if erroneous information has been entered. An attempt will now be made to describe how the computer solves the typical gunnery problems. Refer to Fig. 2. Note the category selector switch shown in the lower left hand corner. On arrival in the battery area the category selector switch would be set to the top position (topographical data). The co-ordinates of troop centres, Ops and the gun lay-out would be entered as would crest clearance data, safety zone data and grid. The computer will accept locations for nine troop centres, three different calibers, 36 Ops, 100 BPs, 10 safety zones and five obstacle (crest clearance) sectors. It is not yet programmed for the L5. If survey data had to be the category selector switch would be set to the next lower position, survey data. The operator may now carry out all common survey computations such as triangulation, trilateration, traverse resection and transformation of co-ordinates. As the category selector switch is changed, the information shown in the lighted window at Fig. 2 would also change, and, for example, what is shown as Stored Target in Fig. 2 might become distance on a traverse leg. The category selector switch would then be switched to gun and ammunition data which permits the entry of muzzle velocity data for all charges and a ballistic constant (K) for each charge. The category selector switch could then be set to Met data which can be entered using the standard NATO format. Firing data is the next position for the category switch and is the one for which Fig. 2 is prepared. Targets can be engaged by any of four methods: stored target (recorded target) laser target (polar co-ordinates from the observer), co-ordinates of target, or, with reference to a reference point or recorded target. This row of buttons is shown above the arrow on Fig. 2. Adjustment is carried out by sending new polar co-ordinates from the laser range finder or by normal target grid procedure. The Odin is a very easy computer to operate. Artillery technicians of 2 RCHA were trained to perform all normal operations in about three hours. Maintenance appears to be simple and the hardware extremely rugged. Odin is fast and reliable, gun data being produced in about 10 seconds. Breakdowns were few and simple to correct. In summary, the Odin computer and its associated equipment seems to be ideally suited to the roles of the Royal regiment of Canadian Artillery. Ultimately it could save us considerable training time and perhaps reduce the number of Artillery technicians required. Those of us in Petawawa who were exposed to the Odin computer sincerely hope that a computer system of this type will be procured in the near future.